The first real post has to be dedicated to my favourite form of transport; bicycling! Coming to Oldenburg is like going to heaven, in this regard. The culture of bicycle use is instilled from a very early age and continues right through to the very old. But the weather in Northern Germany isn’t the best (with respect to South African weather), so you may wonder just how dedicated the locals are during one of the frequent wet spells… I have heard, from one particular Oldenburger, that there is no such thing as bad cycling weather, just inappropriate clothing. And that pretty much sums it up. Come what may the bicycle is by far the most popular form of transport around here. The flat terrain does obviously help too. Bike Jam – I’ve been part of a bike jam while cycling to university in the morning rush. Roadworthy checks – I was almost stopped at a bike block two nights ago. The Polizei take their job very seriously and I’ve heard that €10 fines are dished out for non-functional front or rear lights. Second hand smoking – Ever ridden behind somebody who is smoking? It seems like the people of Oldenburg like smoking almost as much as they do bicycling. What a pity! Being the cart horse – Some kind people have lent us their old kiddie bike trailer and I took the family on a lovely canal path ride before the workload got too much. 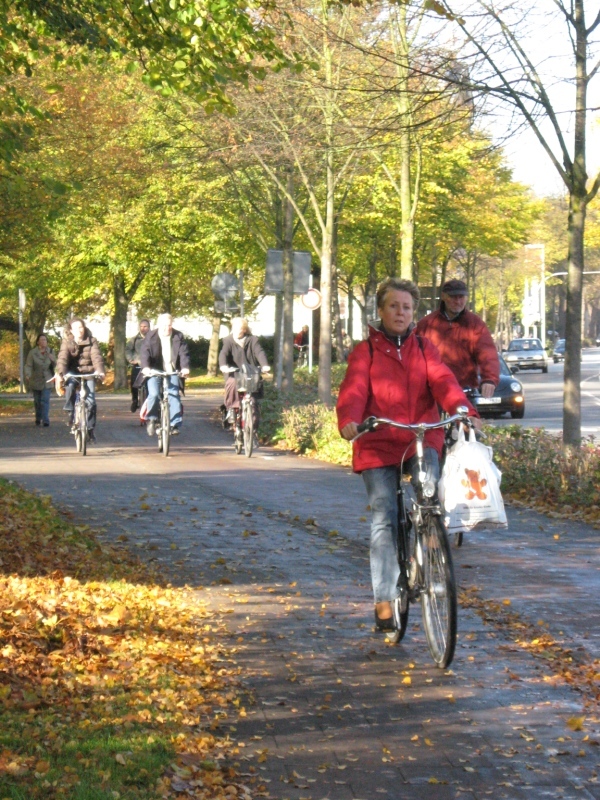 In order to support this healthy habit you have to have a fantastic network of cycle paths. Where space allows, the pavements are divided into two lanes. The lane closest to the road is for bikes and the other one is for pedestrians. The demarcating line is denoted not by a painted line (too much maintenance) but by a different type of paving stone which I thought rather clever. In addition to the network of paths there has to be a commonly accepted set of rules for bicycles to happily co-exist with vehicles and pedestrians. The bottom line is…the bike is KING in Oldenburg. At all intersections bicycles have the right of way over cars. Pedestrians tend not to mess with a moving bike. This entry was posted on Thursday, October 30th, 2008 at 02:35 and is filed under EUREC, Oldenburg University. You can follow any responses to this entry through the RSS 2.0 feed. You can leave a response, or trackback from your own site.